Japanese honeysuckle 'Gold Flame’ (Lonicera x heckrottii 'Gold Flame'): growing, planting, caring. A climbing cultivar with flashy red, pink or yellow flowers. Full description for Lonicera x heckrottii 'Gold Flame' not yet available. 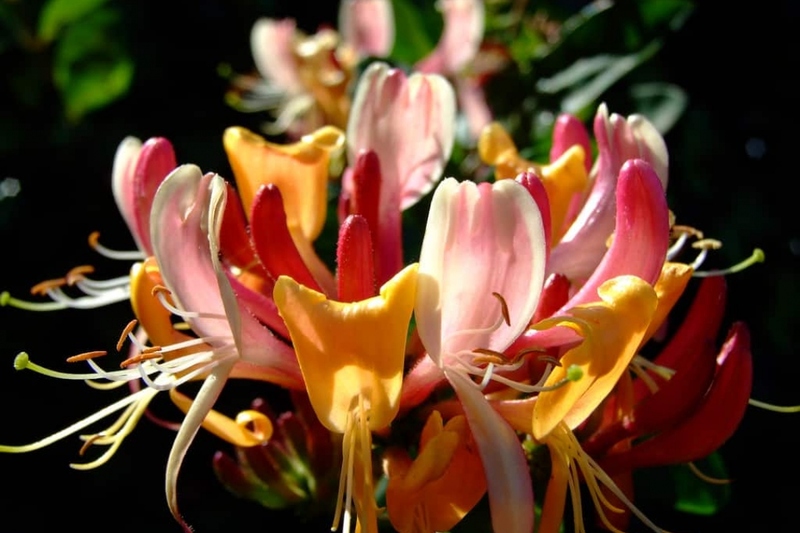 The climbing honeysuckle 'Gold Flame' has oval, opposite leaves, dark green on the top and blue-green on the underside. Autumnal berries are red and the flowers are brightly colored, orange-yellow and pink. No pruning is really necessary for climbing honeysuckle. If you want to operate a pruning to rebalance its antlers, wait until the end of flowering. If your honeysuckle begins to thin, it is also possible to perform a severe pruning in late winter to shorten every branch, it will grow more beautiful!